Pro-democracy leader Aung San Suu Kyi held a religious ceremony at home and then paid tribute at her mother's tomb near the southern gate of the country's landmark Shwedagon Pagoda on the 22nd anniversary of her mother's death, which fell on Monday. 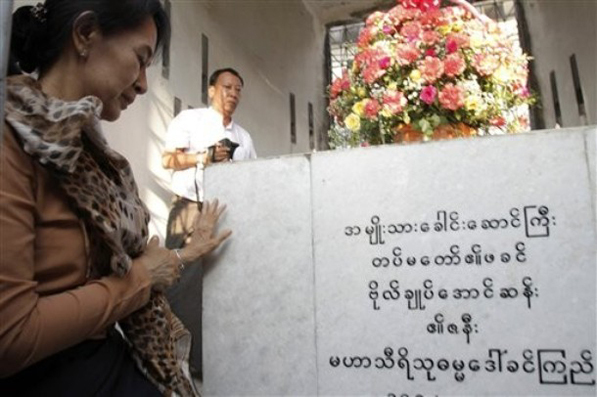 Khin Kyi, wife of Burma's national hero General Aung San, died on Dec. 27, 1988 after suffering a severe stroke. Hearing of her mother's illness, Suu Kyi immediately flew from London to Rangoon to take care of her mother, but she also unexpectedly witnessed the illness of the society where she was born following a series of the peaceful student demonstrations against the military regime. When the military government brutally cracked down on the demonstrations, Suu Kyi became involved in politics to seek a peaceful political solution, transforming herself to a lady with an iron will and unwavering commitment to democracy, which she has maintained until this day. Khin Kyi, who was regarded highly by Burmese society, stepped into politics after Gen Aung San was assassinated by his political rival in 1947, becoming a member of parliament in the first parliament of independent Burma. After that, she became the first woman ambassador to India. "Aung San, a national hero, an independence hero, a leader, a martyr, a father of Burma army, has never ever died. As for her husband General Aung San and also for the country Daw Khin Kyi is a great lady who devoted most of her life in humanitarian works and sacrificed for the country doing the job as the first Burmese woman as Ambassador abroad to examplify the noble work for the peoples of Burma." VERY GOOD INDEED!Daw KhinKyi,Karen Myanmar, is a true Myanmar Patriot, who served her Burmese husband with such devotion, love and loyalty. Can you say the same about the traitor woman SuuKYi? What a great pity that the traitor SuuKyi usurped her brother, U AungSanOo, a true Myanmar patriot! The traitor woman will get a letter form us. She must leave BURMA! Aung San, a national hero, an independence hero, a leader, a martyr, a father of Burma army, has never ever died. As for her husband General Aung San and also for the country Daw Khin Kyi is a great lady who devoted most of her life in humanitarian works and sacrificed for the country doing the job as the first Burmese woman as Ambassador abroad to examplify the noble work for the peoples of Burma. Now Suu Kyi became like a father and mother and is sacrificing her life for the sake of the country and its peoples, those suffering in various ways of oppression and and inhuman treatment to all ethnic groups by Than Shwe's regime. In such a situation, the poeples of Burma have to struggle to prevail democracy in Burma under the leadership of the nonviolent movement led by Aung San Suu Kyi. The present military generals are like neo-Nazis, so those who ever challenge their power they will crush, so Suu Kyi has to be very careful this time for her steps to go ahead should be within the laws & high diplomacy.